As a child, Chris Hooper dreamed of monsters. But in deep space, he found only darkness and isolation. Then, on planet LV178, he and his fellow miners discovered a storm-scoured, sand-blasted hell - and trimonite, the hardest material known to man. ....Ellen Ripley, the last human survivor of the salvage ship Nostromo. 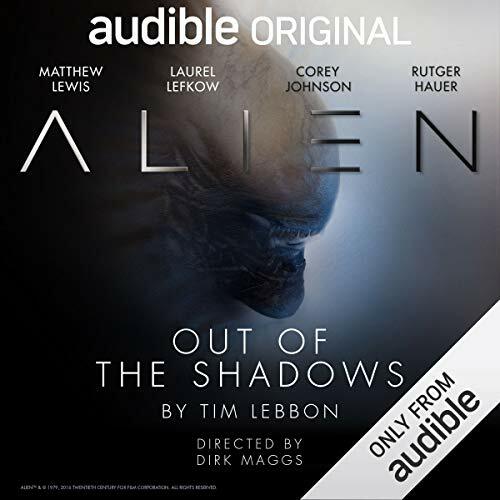 As an Audio Show - free for members - when you add Alien: Out of the Shadows to your library, you'll get all 10 episodes, each with a runtime of about 30 minutes. I had very low expectation since it was free, but man, it was really good! Very well acted and great sound effects. I was thrilled to listen to this storyline and it's believable extension of the Alien story! Absolutely loved it! Great twists! First off I cannot believe it was free, Second of all I can’t believe the quality. It was perfectly set between the first movie and the second movie. The voice acting was superb the sound effects were great the story was awesome and it’s addition to the franchise is flawless. I don’t like when trolls complain about franchises like this, these franchises have been around for ever now and there’s a reason for it and this is a fine addition I recommend this to everybody and to audible if there’s any more free versions please put it in my suggestions. A very cool story based off of Alien Novel. Not too long and just the right amount of captivating.